Stand in a patch of clover in your garden and if you don't see a bee within a few seconds, something might be wrong. like a fence and a gate. Where you see clover, you should see bees. It is that simple. 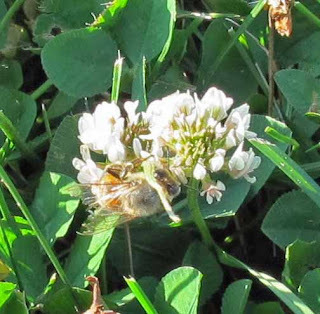 If you have the clover, and don't see any bees, something is wrong. Geez, Carol...these days, clover is considered a weed in most people's lawns and chemical companies make herbicides to kill it. I have a patch of clover, though, and will have to monitor bee gatherings. My first sting came when a honey bee took exception to my walking through a patch of clover with my grandmother when I was about 9. I've got clover and bees! And lots of other wildlife too. Bunnies! Grrrrrr. I over seeded my mowed field with clover. I don't see as many bees as I'd like, but I do see some, mostly native bees. Clover is my favorite of the "weeds" in my lawn. We get tons of bees, and I swear it keeps the rabbits out of the garden--they are content to munch on clover all day long! I believe clover is good for the soil if I remember right so I leave it when I pull weeds in the garden. I don't have clover in the garden--not sure why when I have every other weed known to man. But there's lots in the lawn, and yep, we have bees! Bees and no clover. We have a nice hive in our cottonwood tree up front, very happy bees.